Every woman dreams of being someone’s princess — walking down the aisle in an elegant fairy-tale inspired ball gown wedding dress. Don’t let the toasty weather stop you from finding the wedding dress of your dreams. Here are 10 beautiful wedding dresses for this cheery season, guaranteed to captivate the heart of the groom and set the mood for an enchanting event. Demure, simple yet elegant — this wedding dress is perfect in accentuating your best assets. The sweetheart, floor length satin dress by Weddings Trend has the makings of a fabulous princess gown that any bride-to-be should wear. Its sparkling crystal embellishments on the front bodice spells classic and timeless — while the low laced-up back makes it brilliant for the summer heat. For only a little more than $200, you can already live the dream. More frills, more fun best describe this lush and light satin princess-inspired wedding gown by Fashion Token. This wedding gown is carefully styled with beaded-appliques all over the bodice, playful pick-up skirt for additional highlights and a court train. If you want to wear a figure-flattering gown that reveals just a little of your skin, the square-neck and sleeveless features of this gown will do the job. This gown is best for the princess who loves mixing fun with elegance. This light and airy ball gown of satin and tulle with a Sabrina neckline is very much reminiscent of the fashion demi Audrey Hepburn. If hers is your style, then go for this precious find at Light in the Box. If you are looking for no-frills, no-nonsense, simple clean lines in satin and tulle and are big on elegance, this Hepburn knee-length gown is the right fit for you. It is definitely ideal for a beach themed wedding. 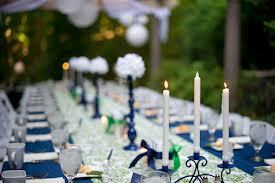 The season guarantees to be cheery and perfect for your dream garden wedding. This refreshing one-shoulder floral-accented garden wedding dress by Shein Dress is made of tulle. It is sure to make you stand out even as you walk through a garden path dreamily-lined with the most beautiful flowers. 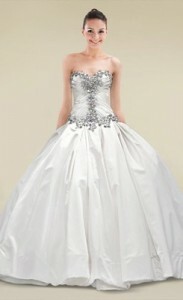 Of the entire ball gown wedding dresses, this makes the grade in the simple-stylish-elegant category. This alluring floor-length empire-cut gown is your ideal if you have the upper body curves to accentuate. Designed by The Dessy Group, this guipure lace gown features intricate beadwork on the waistband and shoulder straps. 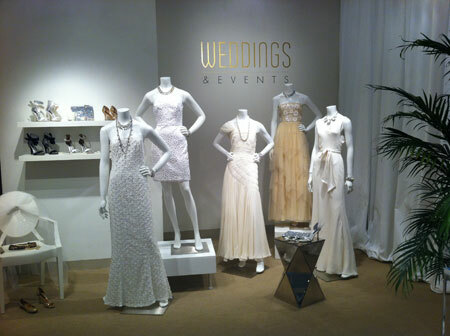 At a little over four hundred dollars, this masterpiece for every minimalist bride-to-be is quite a catch. The feel of this sheer, soft and delicate wedding dress made of chiffon is sure to keep you in high-spirits even under rising temperatures this summer. The crisscrossed shoulder straps that cascade to flowing drapes at the back make a beautiful statement as you walk towards the man of your dreams while the drapes pleasantly follow the wind’s bidding. Made by Wedding Dress Trend, this exquisite wedding gown spells free-spirit. Another best bet for this hot weather is this simple, low-neck, one-shoulder, floor-length satin dress by Bayley. If you are well-endowed in all the right places, you will shine in this one. The bodice is covered with beads and hugs pleasantly around your curves. This empire silhouette organza wedding gown is what you need if you want to stylishly walk down the aisle by the shore. The mixed high-low length of this dress makes it trendy and fun and allows for a little beach frolicking as part of your wedding memories. Should you want to take a dip after the ceremony, the cleverly-designed, easy-to-shed-off feather-shaped skirt comes in handy. This fabulous wedding gown is by Tulle and Chantilly. Most summer bride’s criteria for a wedding dress that beats the summer heat is this: light, simple with a hint of sophistication. The harmony of satin and tulle makes this A-line, bateau, knee-length wedding gown a definite breath of fresh air. 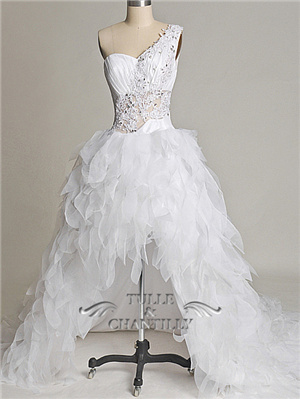 Adding to its appeal are the scattered beads on the bodice and a nice floral sash around the waist. 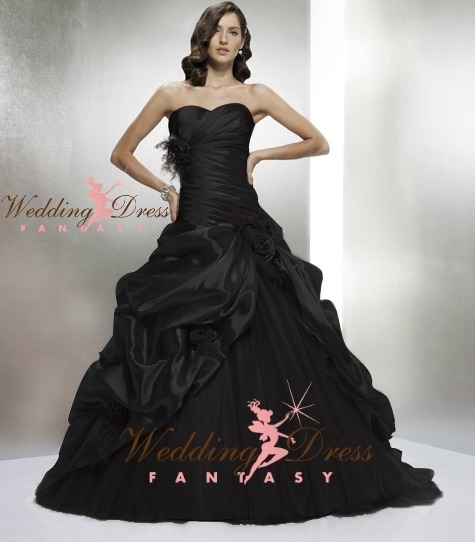 This summer ball gown wedding dress is great for anyone with lots of beautiful skin to show. 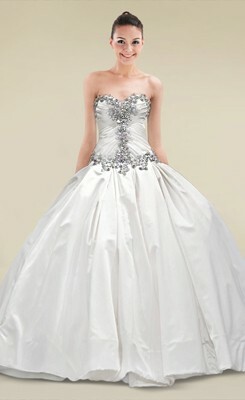 Another Light in the Box Princess beauty is this A-line, V-neck, floor-length wedding gown made from sheer tulle fabric. 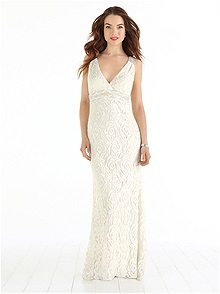 This gown’s crisscross neck line is delicately embellished with lace to highlight the bride’s upper body. Its whole regal look is punctuated by a beautiful corsage-like piece of applique on the right shoulder. A blissful wedding on this side of the digital world is made of these ball gown wedding dresses, princess bride-to-be and a willing groom to make it all happen. Which one suits you perfectly?